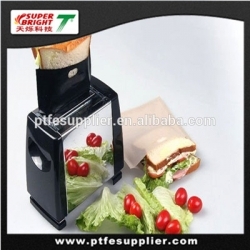 In the PTFE Roasting Bag , you can prepare toasted sandwiches, garlic bread, slices of toast in an ordinary toaster, grill or toasted sandwich-maker. 100% non-stick PTFE coating. PTFE Roasting Bag Provide an ideal solution for people with celiac disease. By using the bags in the toaster you can keep gluten-free bread quite separate from wheat bread crumbs in a toaster. It completely eliminates the chance of cross-contamination.